Knowing how to work more than one muscle at a time can make the difference between making it to the gym a few times a week or not at all. With some basic knowledge however you can learn to train all your muscles in a very short space of time, allowing you to spend minimal time at the gym and get maximum results. Some of the following exercises, if done incorrectly can be dangerous. So before attempting any of the following it is recommended you seek guidance from a qualified trainer to minimize risk of injury. This exercise is a favorite of powerlifters and athletes because it helps develop explosive power. It works the legs, shoulders, arms, back and hips. Stand with your feet shoulder-width apart with a weighted Olympic bar over the middle of your feet. Keeping your back straight, bend down and grasp bar with an overhand grip. Ensure your knees do not go out over your toes, and lower your buttocks until your thighs are parallel with the floor. Pull the bar off the floor as you stand up straight. Once the bar reaches your chest, pause for a second before you push it above your head with your upper-body muscles. Despite the odd name dead lifts are another firm favorite with most athletes because of its multi-jointed nature allowing for maximum use of all muscles. The dead lift also requires a weighted Olympic bar. Begin with the same starting position as in the Clean and Press. Once your thighs are parallel with the ground and back straight, contract your shoulder blades, look forwards and pull the bar upwards as you stand up. Emphasis should be placed on driving the weight upwards with your lower body muscles and back. Pause briefly at the top of the movement before lowering the bar back to the ground in a controlled manner. It is extremely important to keep your back straight at all times to minimize risk of injury. The squat uses most of the muscles in your body. While you’re whole lower body is doing most of the work, your upper body is stabilizing and supporting the weight. This exercise is best performed in a squat rack with safety rails or using a smith machine. Begin by placing the bar just at the top of your shoulder blades. Do not rest it on the back of your neck as this will cause injury. Once comfortable, remove the bar from the rack and ensure your feet are shoulder width apart and facing forwards. Looking forwards and keeping your back completely straight, lower the weight towards the floor keeping your knees behind your toes. Once your thighs are parallel with the floor you explode upwards by extending your knees and driving your hips forwards. It helps to look upwards as you lower the weight. This ensures your back stays straight. A kettlebell is a bowling ball-sized cast iron weight with a handle that has become extremely popular. The reason for the surge in popularity is because it is a great way of exercising your whole body, building both strength and stability. The first kettlebell exercise to learn is the kettlebell swing. 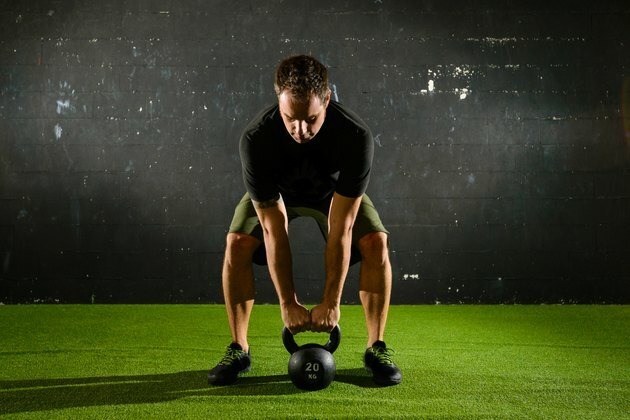 You begin with your feet shoulder width apart with the kettlebell between your feet. As in the squat, you keep your back straight and lower your body to the floor to pick up the kettlebell. You then swing the kettlebell upwards in front of you as you stand up straight. While this may sound straight forward it does engage all of your muscles and is extremely difficult to do repeatedly. The squat, clean and press and dead lift can be combined to train all your muscles in one movement. This is called a complex: a series of exercises done in succession. Using a fairly lightweight you begin with your feet shoulder width apart and a barbell over the tops of your feet. Keeping your back straight, lift the bar upwards as you stand up straight. Once the bar is chest height, push it upwards using your shoulders and arms. Once at the top of the movement lower the barbell to the top of your shoulder blades emulating the squat starting position. From here, squat down keeping your back straight and drive the weight upwards. At the top of the movement again push the weight upwards over your head using your shoulders and arms. Lower the weight to your chest and then the floor ensuring your back is kept straight throughout.